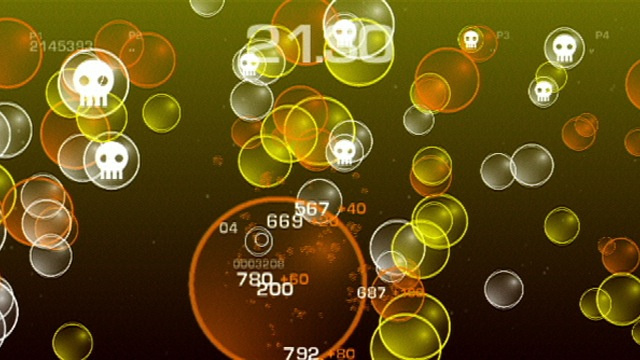 'Once you pop, you just can't stop' is proved to be true in this excellent WiiWare launch title. Pop is all about popping bubbles! It may sound simple, but there are lots of things you can do to get a high score and have fun. Just keep an eye on the timer because when it runs out, it's game over! 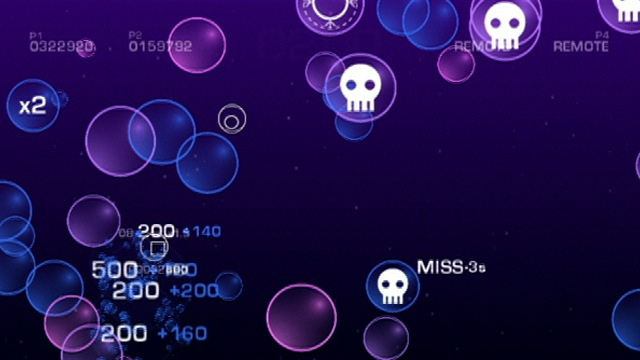 Each bubble is worth both points and time so try to fill up your timer first, then focus on scoring high. You can then start to chain the same colour of bubbles together and pop them for big points - a great way to increase your score! Friends can join you in a game of Pop, too! Whenever you are playing, all they need to do is grab their Wii Remote and then join in the action. Watch out because they may start using power-ups to hold you back! If they do try to pump up some bubbles or detonate a nuke, this will create a shockwave which will destroy any matching colours of bubbles it touches. Finally there are badges for completing certain objectives, online high-score tables and WiiConnect24 messages so you can keep up with your friends’ progress and boast about your own. This game looks strangely appealing to me. For the right price i'd definitely give it a go. nnooo doubt about me getting this game. I know it doesn't look like it has much, but i don't care! This game looks like fun, I want it now!! Popping bubbles... sounds like something I can do without a Wii. Geez, I hope there is more to this game than just bubble popping. It looks...okay...? I can't really say anything until I play it, but it'll probably be alike to Wii Sports in that it is fun in short jaunts. Though the music is great...in a weird way! it looks fun, but we'll have to see about the price. I don't know how much replay value it'd have. It'd probably get boring after a while. So for 300 points, maybe. It couldn't have cost too much to make the game. Yeah a game that I'd get only if it were cheap honestly. This one's a maybe for me at the moment. It does look interesting, but there may be other games that grab my attention first. Looks pritty cool. Wounder how it plays. Sounds promising. I like the music to this. I was skeptical at first, but I think I might consider buying this if the score from WiiWare World is highish. This seems like a fun "kill time while drunk/faded" game... I'm definitely getting it once I know if B pops the bubbles (or can be set to), since I see this as a relaxed Point Blank level. Well, I was going to buy Dr Mario (there's still hope it may come out anyway), but this looks like challenging fun and something my fiance or my mom could play on a simpler level. BTW, I dig those radioactive symbols; I wonder what they do??? Technically, as it is 10:40am CDT, and Pacific time lags us by two hours, it should not be up until 20 minutes from now, but they released it early!!! I just downloaded Pop and have to say it's really addictive and worth the 700 points. @StarDust: I just finished my first round of Pop at 2.9 million and saw you right above me on the leader boards. I just had a quick go on Pop. For anyone doubting this is actually quite good fun. 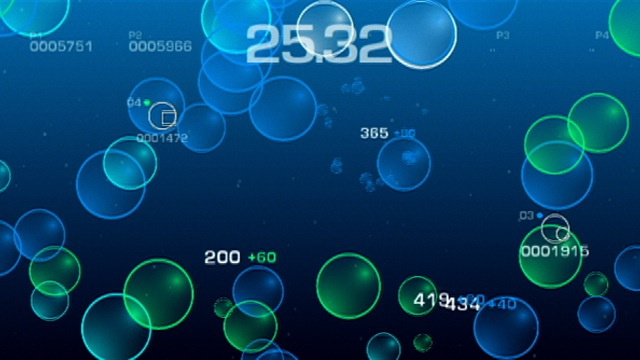 Yeah you are just popping bubbles but once you get the hang of it you can do some great chains and mix things up with the multipliers to boost your score. The WiiConnect stuff looks pretty neat too. You can challenge your friends scores and even get it to automatically send updates to them it seems. I am #120 in the world at the time of writing! I just had my second go on Pop and I did a lot better this time. I am now at #56 in the world (one under StarDust!) with a mighty 3019061 points. I was going along fine stringing together mad chains of colours and then on level 12 it all just got too much! I made foolish mistakes and a screen of skulls taunted me. Before I knew what hit me it was all over! I'm getting 2000 points soon. Since I have 200 points left over from my last shopping spree, I can sqeeze Pop, Defend Your Castle, and Lost Wiinds (pun) out of my card. Nice. I hope I can still compete with all of you even though I may not be able to purchase Pop until later this week! @O'ban; @Dazza - Kudos to you both. I had a feeling that my reign in the world top 20 would be short lived, so I took a photo of the TV screen. Hopefully, the screenshot will develop clearly as my mom's film camera was the only thing handy at the time. 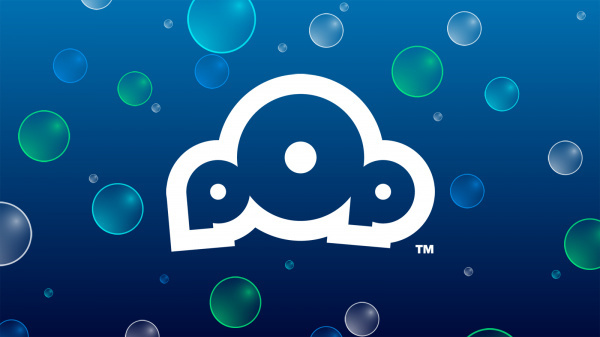 Thanks to all of you who bought Pop on launch day! We are noticing that some people are experiencing crashes when connecting to Nintendo Wifi at the end of the game. If this happens to you you can turn off this feature in the Options menu. Any way to see the leaderboards from a non-wii (ie firefox)? Unfortunately not. We didn't have time to implement web side high-scores. We may try to work with Nintendo and see if there is something we can do tho. C'mon Nic, give us a yyeesss to website based hi-scores! @Nnooo - cool stuff. Thanks for replying so quickly! Hope this game gets much success for your company and leads to more great WiiWare games! Yeah, that's great seeing a dveloper take notice of us fans! Thank you indeed. I for one am interested in this title and it may get gifted to me. I hear the replay value is a little lacking but I'm mostly concerned with the multiplayer experience which, from what I've seen, seems very fun. It being lacking in single player depends on your viewpoint it seems. Quite a lot of people really like the high-score challenge it presents. I hope you enjoy it Knuckles please let me know what you think! I love high score based games, so I look forward to purchasing this. I'll try to climb the leaderboards as quickly as possible! Since I finally beat SMB3, I can devote my time to destroying everyone's high score in Pop. Well, I finally decided to give this game a download and I have to say it's great! The concept is really simple. However, it's not "just popping bubbles" like many people think. 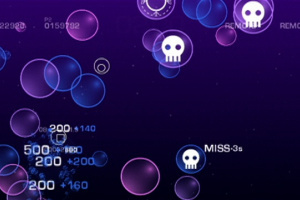 The purpose of the game is to score as many points as possible, and to do so, you will have to indeed pop bubbles, but in a strategic way. 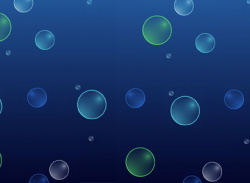 Pop same colored bubbles to create chains. Switch between popping big bubbles for more time or small bubbles for more points. And there are even power ups and hazards thrown in as well. You may be surprised at just how deep the scoring system is. So yeah, there is more to this game than "just popping bubbles". I'd say if you like arcade-style puzzle games, you should definitely give this one a try. I heard somewhere that this has achievements. Any truth to that? And if so, roughly how many? If you have any sort of fondness toward score attack based games this is a must have!!! WiiWare World's Pop review is up now! Will we be able to access the reviews from the overview pages at some point? Or will we always have to follow separate links? Or am I just overlooking the link to the review at the top of the page? Nnooo: Don't worry, I will. You guys deserve a lot more attention for what you guys are doing with the game, and I admire your idea. simple, yet fun, just like Defend Your Castle. I still haven't gotten it yet but when I do, I'm sure the Multiplayer alone will keep me coming back for more time and time again making it a worthwhile purchase in my books, despite the fact that I thought this would originally be only 500 Points. Ha just played again for about 1/2 hr. I got to level 12 and it all went to pot again so I didn't even manage to beat my previous hi-score. I did notice my worldwide ranking had sunk to #489 now so I have a lot of machine gunning to do to catch back up! @Nnooo - Thanks for a great game- Hooray for pOp! Seeing my screenname at #17 will always be a fond memory. I played it later that same day and made it to level 13 and had 3.5 million points (My ranking was up in the 60s at that point, I think). As long as you continue to score points and not run out of time, you will advance levels. You automatically gain level 12 at 3 million. Making mad chains will earn you more badges and advance the levels faster - a requirement for excelling in advanced mode, but not to just get a big score. @Nnooo: one tiny critique I have is that since Advanced is simply a race to get to 10 million points, it could have been combined with Normal mode. (Ex: If you fail to make 10 million in advanced mode, why not be able to save a new high score, or if you achieve 10 million in Normal mode, why not record your "Advanced" time and then continue playing for points). Hey guys! I think Iv'e got the highest score on this game so far! I got like 4 million or something which I got on the first day. It was rank 21 on that day! After reading the review I think I'll get it, if my mates are willing to play it that is. Because the single player sounds too basic for me to part with 700 of my points. But with multiplayer open to me, I would. So if I'm forced to play alone, I think 700 is too pricey for me by 2-300. 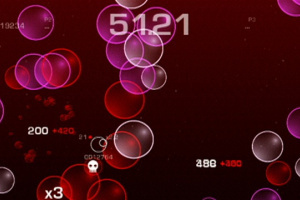 I forgot about the multiplayer this game has, it seems the game for a relaxation or drunk peroid of time with mates. Ouch, just read the IGN review of this, they don't like it. But then again, IGN rarely like quality games anymore. So I'll still buy this I think. I'd love to see more devs do that. Screw IGN. Honestly, don't rely on them. But from what I hear, this game is addictive much like Defend Your Castle and the multiplayer sounds really fun and that greatly appeals to me. Pop is a very simple, yet fun and unique game. And I'm actually glad i bought it. I never really thought, just popping bubbles could be so much fun. The main objective is obviously, to pop as many bubbles as possible. 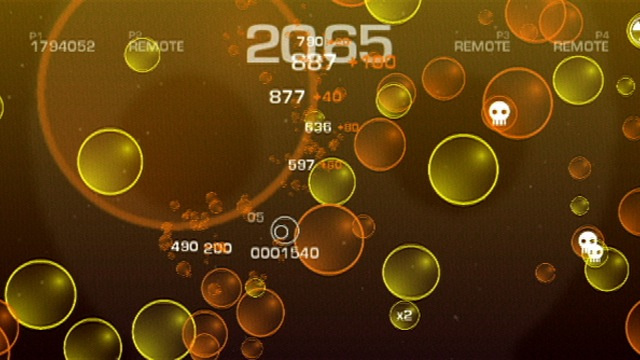 You use the wii remote to move your curser on the screen, then you try to pop the bubbles. you can press A or B to pop the bubbles. small bubbles are worth more points, but you don't get a big time increse, and big bubbles are worth less points, but you get a bigger time increase. if you pop the same bubble colour muliple times in a row, each time you pop one, the amount of points you would get, will increase. But once you pop a different colour, the points you earn will go back to normal. Also if you hold A or B on a bubble, you can inlarge it, and move it. Or if you hold a bubble, and start shaking your wiimote, the bubble will turn into a little bomb and explode where you let go of it. also every time you miss a bubble, you lose 3 seconds, and if you keep missing, those 3 seconds add up fast. Along with your amazing bubble popping abilities, you can also you items in the game. In single player there's three items, and in multiplayer there's 6. So in single player, there's one item, where if you pop it, it will slow time for a little while. Another one is a bomb item. It's just like the bombs you make when you hold a bubble and shake, but this bomb is much bigger and works better. And there's also the pointer inlarger. If you pop this bubble, your cuser will inlarger, making popping bubbles much easier. In multiplayer, you get all of the same single player items, along with 3 new ones. On of them is a lightening bolt thing. If you pop it, you can zap your opponents. 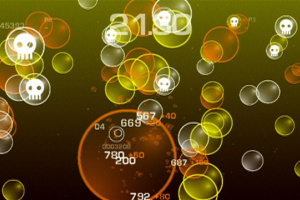 Once your opponents have been zapped, they can't pop bubbles for a few seconds. Another one is the flashlight. 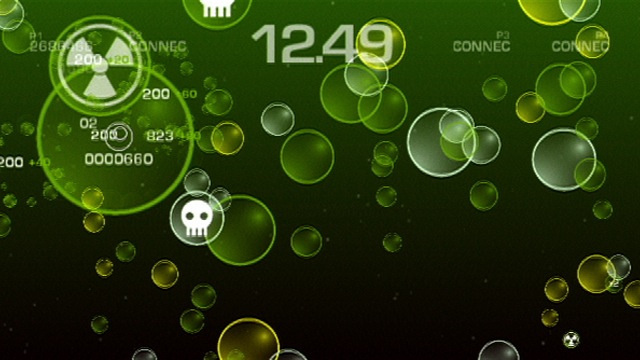 if you pop this one, the whole screen will go black, except for a circle of light around your curser, allowing you to see the bubbles, and your opponents can't. It wears off in a few seconds. And the last one is the shrinker. When you pop this bubble, it shrinks your opponents curser, this way it's harder for him/her to pop bubbles. I gotta ammit, pop did a really good job on this facter. Every level in the game has a different piece of music. And the songs are created in a unique way, like how Do Re Mi did it. Most songs have certain little parts that will just stick to you, or remind you of a game. There's also little sound effects from the remote. 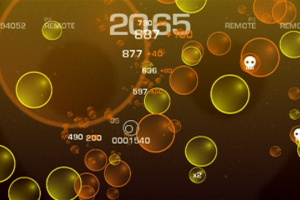 Each time you pop a bubble, the wii remote makes a bubble popping noise. But it's pretty cool, because the sound is different for each bubble. like if you pop a big bubble, the remote makes that kind of sound, if you pop a small one, it makes a little sound. and if you pop multiple bubbles, it makes a whole bunch of sounds. I haven't tied this much, but I'm pretty sure you just pop there without any time. Normal mode has 16 levels with 16 different songs. what i really like about the levels, id that each one is really different fromt he other. Like one might be scrolling left, right, up down, have ocean backgrounds, colourful or dark backgrounds, and different speeds. Like there can be slow speed with lots of bubbles, or slow with not much bubbles, or fast with a lot of bubbles, or fast with not much bubbles, or some can have more small than big bubbles, or more big than samll, some will have more items than others, some will only have one or two. It's really nice, none of the levels ever feel the same. 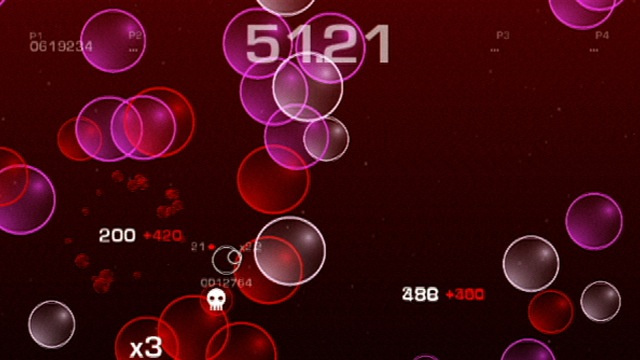 But in Normal mode you just try to get the best score possible. You start out with 30 seconds, and you can make the number go up or down, by popping or missing bubbles. The max time you can have is 99.99 seconds. 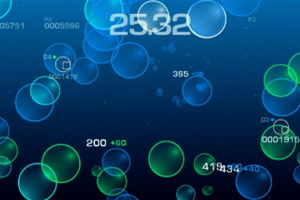 So you must try to get lots of bubbles, while figuring out combinations, and watching your time. and it's cool because in one second you can go from having 90 seconds, to 50 seconds. 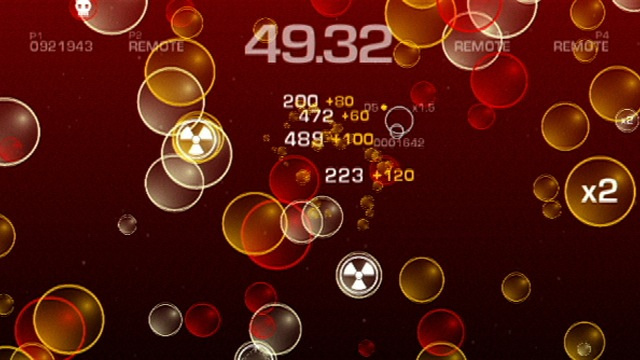 Also there's a few bonus levels in normal, where you just try to pop lots of bubbles in a set of time, then that will be added to your score. Also once you get a game over, it will show you your worldwide ranking, and lets you see who is in the ten ten. Advanced is exactly the same as Normal, but except you start with 20 seconds, and your being timed to see how long it takes you to get 99,999,999 points. And you can also see your worldwide ranking on this too. Chill mode is just you go through the levels, without items, timer, or point, it's just to releax. like if you just want to test out some things, or if you don't want a timer, you just want to pop some bubbles. And there's so many unique things in pop, things no one would even notice, like how when you pop a bubble, every bubble around that bubble reacts to it, or how a bubble pops, or some certain backgrounds and stuff. When I play pop, my time ranges from 20 minutes to an hour and a half. so you can play it in short bursts, or long. I'd have to say, that 700 pounts is a steal, because this game has unlimited deltails, and i can tell Noooo is gonna be a great developer. God that was a long post, I hope Nooo notices it. They will. Nnooo has been great in responding to us. And it's great. 700 Points is a STEAL for this? I knew it! Now I'm almost dying to play this!! And yes, your long post is CERTAINLY appreciated!! I play pop every day. Usually once in the morning and once at night. I play for about 30mins each time, but I never get bored. Pop is something different something new. It's just a great wiiware game, I'm glad I chose it over defend your castle. In the worldwide rankings I'm in 704th place, that's a big jump since last week I was 1531st place! lol IGN seams to hate the things I love about this game! This and Dr. Mario Online Rx I want but all I have is 700 points so il go for this now. Can someone tell me roughly when it's out? Please change the EU date, Wiiware staff! Looks nice! This kind of game is perfect to the Wii Console! 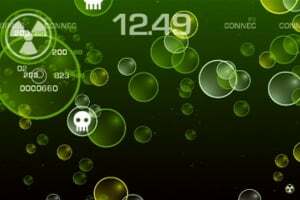 Although I was a bit negative about popping bubbles I have to admit this is the greatest wiiware game out and at 700 points it's a steal. best game ever! bought it today and love it. its so much fun! I've had this for a good few months as my first and currently only WiiWare game. It's pretty decent and utilises the Wii Remote in a unique way. I award it a 7/10. Hey, look at what I found! @Wiiloveit Thanks for providing that interesting article. @Sp3nc3r: Not worth what? The game? If you're going to express your feelings, at least explain why, or what the basis of these feelings are. @The Shoemaker: With over 60 million points, I now stand proud at 38th (Worldwide). Where's everybody else? i got pop a few days ago and have played it a couple times. i'm enjoying it... but i can't figure out how to trigger the next wave. 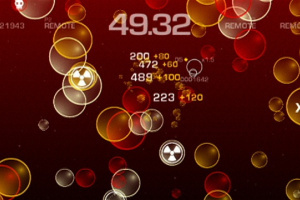 sometime it takes a few minutes, sometimes the level only lasts a few seconds. aha! I have been waiting to review this game forever and now that I've registered, this is the worst game of all WiiWare. 8/10? I bought this game because of that rating. And though I still enjoy this site, I'll never forget that you gave Pop an 8 out of 10. 2/10 at best. I can not wait for the DSi Ware version! Agreed. This game is WAY overrated. I'd say maybe 6/10 considering its release time when there were few other games. My main complaint is the competitive-cooperative aspect. When you play with 4 players, you're trying to get the highest score when the timer ends. However, since you share the timer and anyone that misses reduces the timer, all smart players do is get the highest score as quick as possible and then end the game by missing intentionally. Makes every competitive play last about 3 seconds. News Will You Be Bursting Bubbles Today With Pop? News Where In The World Is Pop?